After the consolidation of political transformation of historic proportions, Nepal is now at an important juncture of undertaking socio-economic transformation. Our key agenda is good governance and socio-economic development. 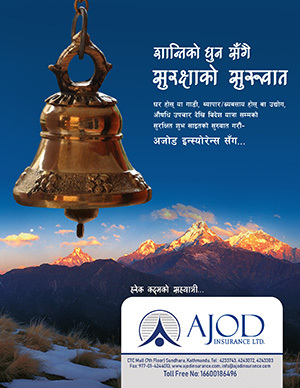 The vision of the government is guided by the long-term goal of “Prosperous Nepal, Happy Nepali”. To achieve this goal, we will have to ensure decent jobs and gainful employment for our working-age population, and modernize our agriculture. Similarly, we will have to utilize our energy potentials especially in hydropower, and promote development of infrastructure, tourism and human resources. In a nutshell, Nepal’s development needs are manifold while the resources remain untapped and underutilized. The financing gap is conspicuous. We believe that unprecedented economic transformation that is taking place in China and India offers huge opportunities for Nepal. As a country situated between the two economic powers, Nepal cannot remain forever in the lower rung of the development ladder. We must climb the ladder, and climb at a faster pace. Onus lies on us, to complement our national efforts by ensuring mutually beneficial cooperation with our neighbours. The Belt and Road, a visionary initiative launched in 2013 by Chinese President Xi Jinping, is an important step that aims at promoting connectivity and cooperation among the countries in the region and beyond. BRI connects nearly two-thirds of world population which account for one-third of global GDP and trade. The transformative scale and scope of this initiative has opened up plethora of opportunities to integrate the economies, to connect the markets, and to invest in infrastructures. As President Xi has outlined, BRI lays out a mutually beneficial framework to build the ‘community of common interest’ and ‘community of common destiny’. To realize Nepal’s development agenda and prosperity goal, it can serve as an important catalyst. We believe that BRI can support countries like Nepal to grow and prosper at a greater speed by ensuring equitable benefits to us. As a framework to spur investment and enhance connectivity, BRI can be instrumental in addressing our development bottlenecks; in mobilizing finance our development needs; and in ensuring win-win cooperation. While the resource gap looms large at global level, BRI can also be instrumental in implementing the Sustainable Development Goals (SDGs). This way, it will serve the global goods in the interest of humanity. While the increasing protectionist tendencies are eroding the rule-based multilateral trading system, BRI can be an option for openness and shared benefits. While the locus of economic development shifts to Asia, BRI can be an engine for a new wave of globalization. Globalization which is inclusive; globalization which is just; and globalization which is humane. The economic growth and development of China is one of the inspiring success stories of our time. In the four decades of reforms and opening, China has maintained an annual average economic growth rate of 9 %. During this period, China’s share in the world economy increased from 2.7 % to 16 %; its GDP per capita shot from $ 1000 to $ 8000. China has uplifted 800 million people out of poverty and the country has emerged as the second largest economy in the world. These impressive figures have astonished the world. Moreover, it has also been an important player in innovation and technological revolution. This year marked the 40th anniversary of the reform and opening up of China. The drive of opening up and reform was indeed a milestone. In a sense, the process of reform and opening up has been complemented by BRI at regional and global level. When fully implemented, the BRI as well has the potential to become a similar milestone –a force of development and a source of innovation. Connectivity remains at the core of prosperity. The connectivity of infrastructures can unleash multiplier effects in economy. With enhanced connectivity, vast opportunities for trade, investment, tourism and people-to-people relations will open up. Cooperation in these sectors will create jobs for the people, multiply economic opportunities and enhance the productivity of the entire economy. Cognizant of this, Nepal and China have committed to enhance connectivity encompassing vital components including ports, roads, railways, aviation and communications within the overarching framework of trans-Himalayan Multi-Dimensional Connectivity Network. We believe that these are vital components for sustainable regional cooperation as well. Nepal used to be an important thoroughfare in the historic Silk Route. It was a vibrant trade entrepot that connected China with the region of South Asia. Given its location and amicable relationship with its neighbours, Nepal can contribute as a connecting hub in the region. Nepal will have much to offer as a vibrant bridge. A bridge which is not only physical or geographical; but also, cultural and civilizational. A bridge that connects not only markets and economies; but also, people and minds. For a landlocked country like Nepal, the importance of connectivity is paramount for ensuring access to the global value chains. Few days ago, Nepal and China finalized the text of Protocol to Agreement on Transit Transport. This Agreement provides Nepal access to all the Chinese seaports. This is an important milestone towards Nepal’s transformation from a landlocked to a land-linked country. Also, we concluded another MoU for building cross-border transmission line with China this year. Trans-Himalayan railway will be a game changer in our development journey. Our two countries have already signed an MoU on Cooperation in the Railway Project. Pre-feasibility study has already been completed. Our two countries have started discussions on various BRI related projects. Connectivity remained the core area of my discussions with President Xi and other State Leaders in China on my both visits. Similarly, Nepal and India are committed to further intensify cross-border connectivity – connectivity of railways, highways, transmission line and gas pipeline. Likewise, Nepal has signed a power trading agreement with Bangladesh as well. The regional organisations such as SAARC and BIMSTEC are also important platform for multidimensional regional connectivity. We must make these regional organizations fully functional and result oriented. Connectivity was the most important topic of our deliberations during the 4th BIMSTEC Summit. We have signed an MoU on Energy Grid Interconnection, demonstrating our keen desire to promote cooperation in the vital sector of power. Once we develop adequate connectivity, the land-linked Nepal can also be ‘the land that links’. Each country has its unique realities and requirements. “One-size-fits-all” approach cannot cater to diverse development needs of different countries and regions. The development path of any country is dictated by the ground realities and socio-economic context. I would like to dispel apprehensions, if any, by stating that the Government will be solely guided by the national interest in selecting or accepting projects and programmes under any bilateral, regional or multilateral mechanisms. We will not be swayed away by any opinion or views that are not objective and grounded on realities. Nepal’s priority is to liberate the people from the inhumane trap of underdevelopment and to break the vicious cycle of poverty. Unhealthy mix of inertia and cynicism, unfortunately, will only perpetuate such trap. And if we fail to take the call of the time, then it will be the biggest crime against the generations to come. To realize the agenda of prosperity, we will pursue the avenues of cooperation with our neighbours in conformity with our national interest and priorities. Nepal and China are close friends and good neighbours, sharing a historical friendship which has always remained cordial and trouble-free. Guided by the Five Principles of Peaceful Co-existence, our two countries are determined to take our relationship to newer heights for our mutual satisfaction. BRI offers a unique opportunity for both of our countries to explore and exploit vast potentials for development for shared prosperity.